Many people think that brightly colored fruits and vegetables or dark, leafy green have the most nutritional value. However, the Mayo Clinic advises that potatoes are more than just a carbohydrate: they’re a good source of vitamin C, vitamin B-6 and potassium. In fact, if you eat them with their skins, you nearly double the amount of fiber. So take a shot at this easy, filling side dish. You can learn more about the nutritional information of this side dish here. 1. Preheat oven to 400 degrees F. Lightly coat a large baking dish with cooking spray. 2. In a large mixing bowl, add the whole potatoes, garlic, olive oil, rosemary, salt and pepper. Mix thoroughly (hands work best) until the potatoes are coated evenly with the oil and spices. 3. Arrange the potatoes in a single layer in the prepared baking dish. Cover with a lid or aluminum foil and bake for 25 minutes. 4. Remove the lid or foil. Turn potatoes and bake uncovered until the potatoes are soft and slightly browned, about 25 minutes. 5. Transfer to a serving bowl and mix with butter. Sprinkle with parsley and serve. Ready to cook? 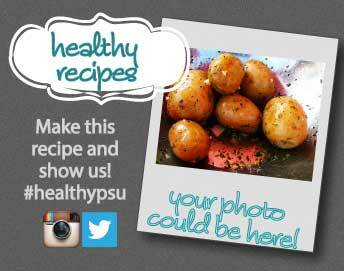 Snap a pic of the finished product and upload it to Instagram with the hashtag #healthypsu. Your photo could be shown here!